Cobertura: Todo Atlântico Norte e Pacífico até 140 graus Oeste de Latitude. 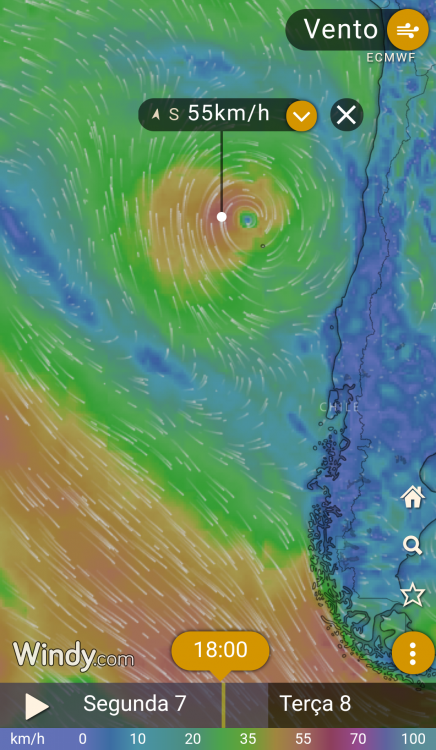 Classificação de Fases: Depressão Tropical (Até 62km/h); Tempestade Tropical (63 a 118km/h); Furacão Cat.1 (119 a 153km/h); Furacão Cat.2 (154 a 177km/h); Grande Furacão Cat.3 (178 a 208km/h); Grande Furacão Cat.4 (209 a 251km/h); Grande Furacão Cat. 5 (Acima de 252km/h). Alberto, Beryl, Chris, Debby, Ernesto, Florence, Gordon, Helene, Isaac, Joyce, Kirk, Leslie, Michael, Nadine, Oscar, Patty, Rafael, Sara, Tony, Valerie, William. Aletta, Bud, Carlotta, Daniel, Emilia, Fabio, Gilma, Hector, Ileana, John, Kristy, Lane, Miriam, Norman, Olivia, Paul, Rosa, Sergio, Tara, Vicente, Willa, Xavier, Yolanda, Zeke . Eventualmente alguns sistemas se formam entre as Latitudes 140 e 180 graus a Oeste, fora do limite do Pacifico Leste. Essa área é conhecida como Pacífico Central. Na designação de INVEST aparece com o sufixo "C". 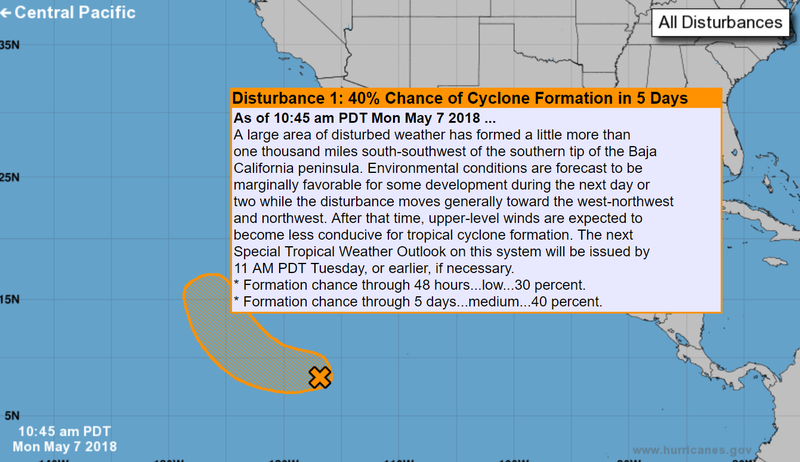 Essa bacia é monitorada pelo CPHC (Central Pacífic Hurricane Center) em Honolulu no Havaí. Assim como no Atlântico, sua temporada vai de 1 de Junho a 30 de novembro. Qualquer sistema que se forme nessa bacia, preferencialmente será postado nesse tópico. Walaka, Akoni, Ema, Hone, Iona, Keli. Above: Hurricane Irma as seen in moonlight by the VIIRS instrument on the Suomi satellite at approximately 3 am EDT Wednesday, September 6, 2017. Barbuda was in the southeastern eyewall of Irma at this time, and Irma was headed west-northwest towards St. Barts. The eye of Irma passed over St. Barts about three hours after this image was taken (radar loop here). Puerto Rico is visible at the left of the image. Image credit: NASA. Hurricane Irma smashed through the Leeward Islands in the early morning hours of September 6, 2017, as a catastrophic Category 5 hurricane with 185 mph winds. Irma clobbered the islands of Barbuda, Saint Barthélemy (commonly called St. Barts), Saint Martin/Sint Maarten, and the British Virgin Islands at peak strength, making it the strongest Atlantic landfalling hurricane in recorded history. As typically occurs during a Cat 5 landfall, wind measurements during eyewall passage were hard to find, since the storm destroyed the measurements sites and/or knocked out their power. 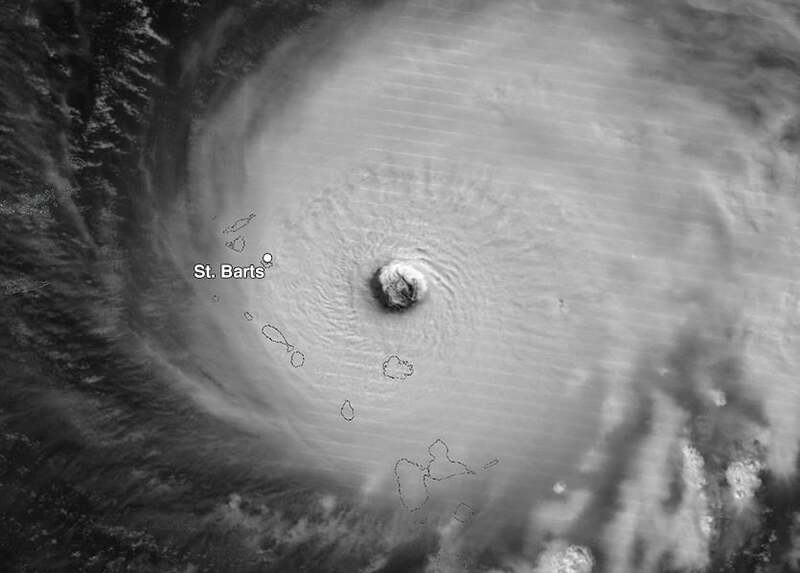 The highest winds at an official site during Irma’s passage were on Barbuda, where a NOAA National Ocean Service station reported sustained winds of 118 mph (190 km/h) with a gust to 155 mph (249 km/h) at 12:54 am EDT September 6, before the instrument failed. Figure 1. 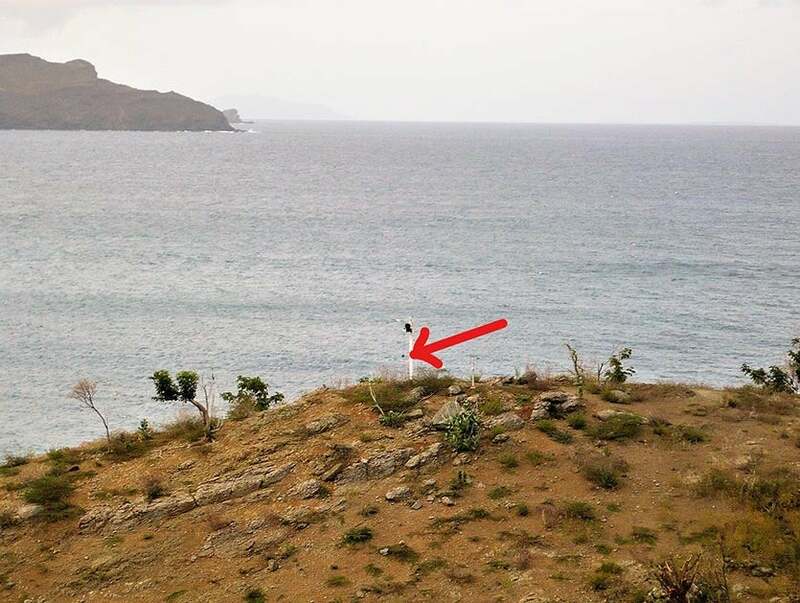 Serge Brin’s personal weather station (PWS) on St. Barts (ISAINTBA3), after Hurricane Irma had severed the 21-foot pole housing the anemometer. The view is to the northwest from the north coast of St. Barts. Image credit: Serge Brin. However, Serge Brin, owner of a Weather Underground personal weather station (PWS) on St. Barts (ISAINTBA3), wrote me to report that he received a direct hit by Irma, but his PWS stayed up during passage of the front eyewall and a portion of the back eyewall, before flying debris severed the pole housing the anemometer. Before failing, the station measured the highest wind gust ever recorded by a PWS on the Weather Underground network: 199 mph (320.3 kph). It is quite rare to see a wind gust measurement this high; in fact, there have only been four reliably measured wind gusts in world history stronger than that. The world record wind gust is 253 mph at Barrow Island, Australia, during Tropical Cyclone Olivia in 1996. The second highest wind speed ever measured was 231 mph (370 km/hr) on the top of Mt. Washington, New Hampshire, on April 12, 1934, during passage of an extratropical storm. 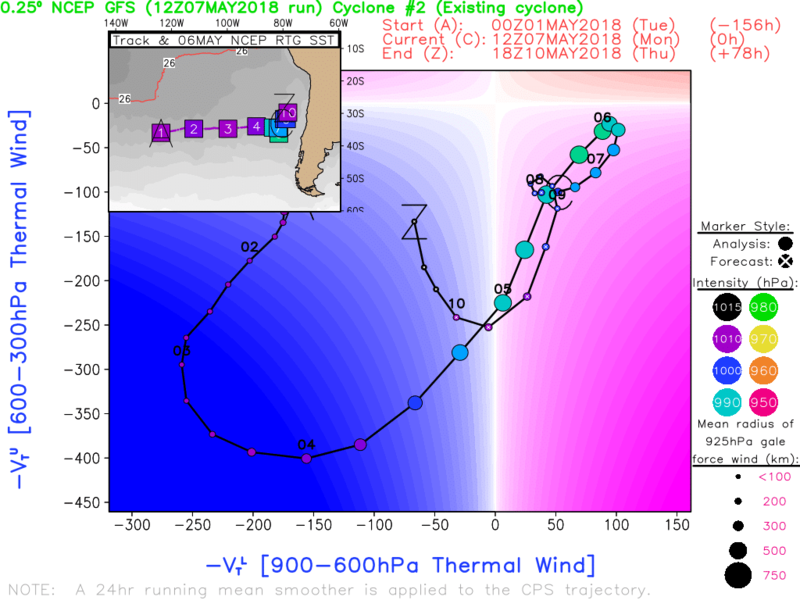 Third place is a 211 mph gust in Cuba during Hurricane Gustav in 2008, and the fourth highest wind gust on record was the 207 mph gust measured in Greenland at Thule Air Force Base on March 6, 1972. The instrument that measured the 199 mph gust in Irma was a Davis Vantage Pro II. This instrument has a 200 mph (322 kph) design limit to its wind speed measurements, so it is quite possible that the actual winds were higher. Mr. Brin reported: “Just after the big gust, the counter suddenly went to zero for about thirty seconds, then, normal operation resumed. Does this malfunction indicate exceeding of the capacity of the anemometer? 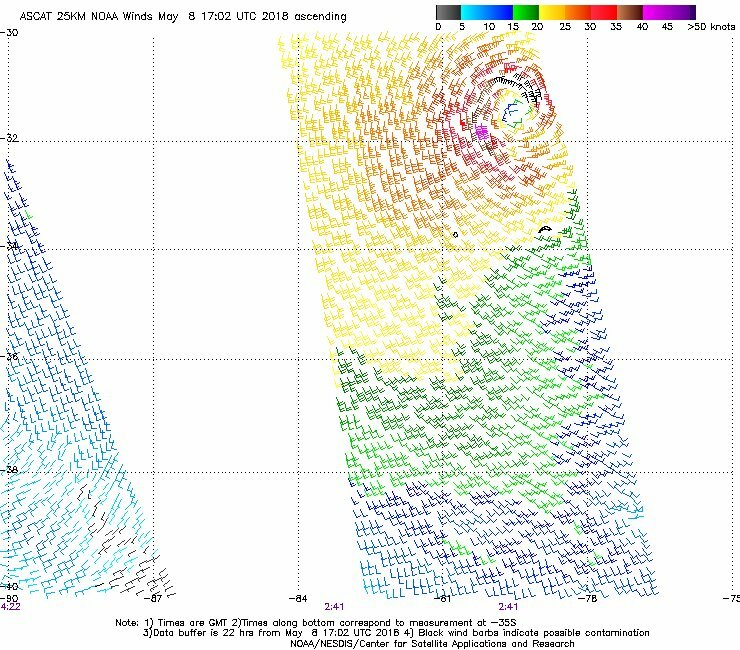 The question remains!” Peak sustained winds over a 30-minute period at Mr. Brin's PWS site were 106 mph (170.6 kph). These must be increased by a significant factor to convert to the 1-minute average sustained winds that the National Hurricane Center uses. Figure 2. 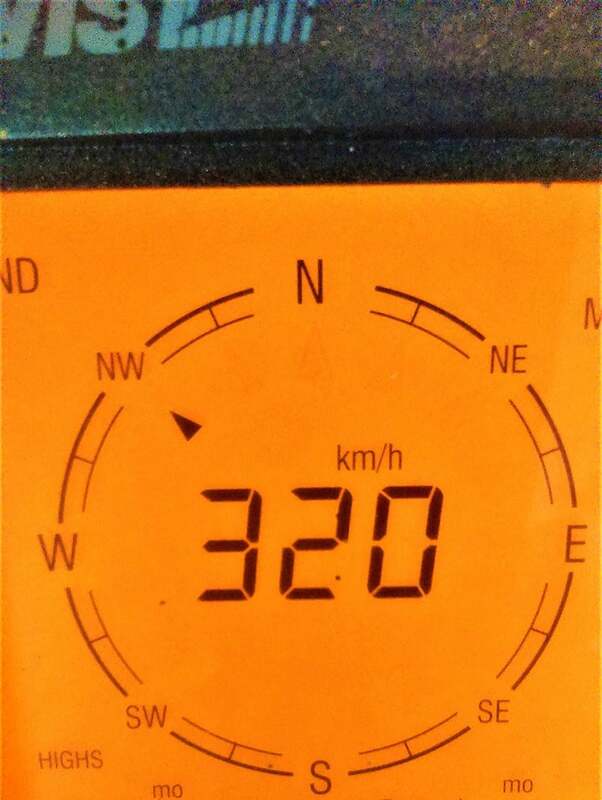 Image of the console display of Serge Brin’s personal weather station on St. Barts (ISAINTBA3) during the peak winds of Hurricane Irma, when the anemometer recorded a 320.3 kph (199 mph) wind gust. Image credit: Serge Brin. A few caveats to the measurement: standard wind measurements at airports are done at a height of 10 meters (33 feet) above flat ground. 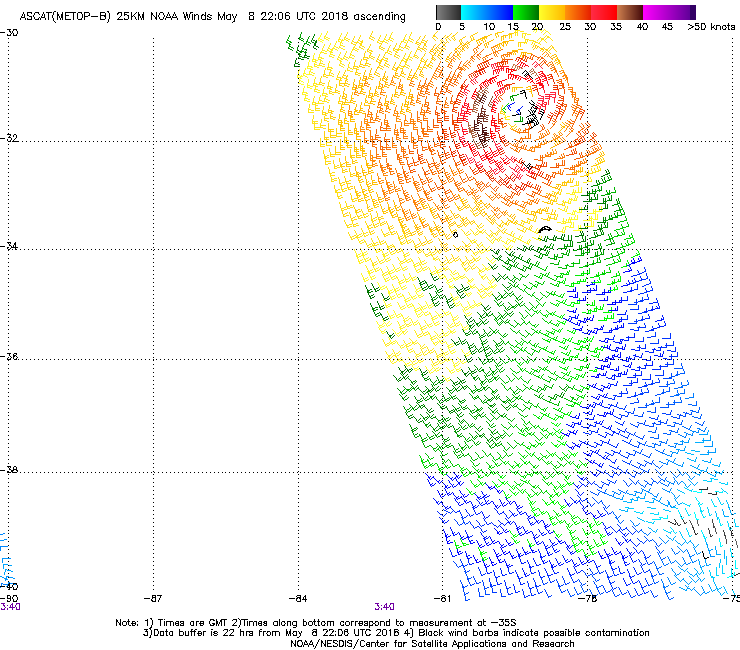 The ISAINTBA3 instrument was on a 21-foot high mast above ground, so it measured a lower wind speed than if it had been at the standard 33-foot height above ground level. However, the station was situated on a bluff at 50 feet elevation overlooking the ocean; this exposure likely increased the winds above what a measurement station on flat ground would have seen. The bluff faced to the northwest towards the ocean, and the peak winds were measured when the front eyewall of Irma was bringing north-northwest winds directly from the ocean to the site. 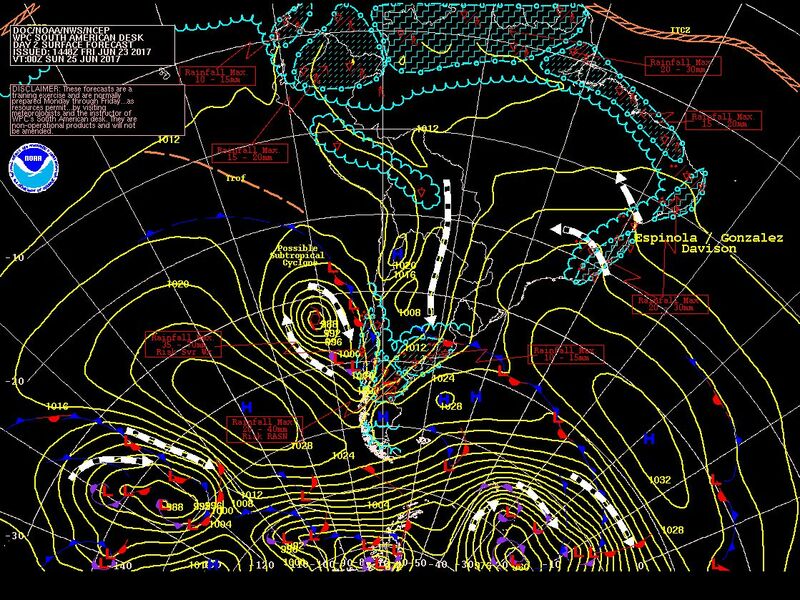 The minimum pressure measured at the site during passage of the eye was 916 mb--the same as that recorded at the St. Barts airport. Mr. Brin estimated a storm tide of 10 to 12 feet, and the calm of the eye lasted almost one hour and a half. He heard his roosters singing outside during the calm of the eye. His house was damaged, but not excessively. Figure 3. 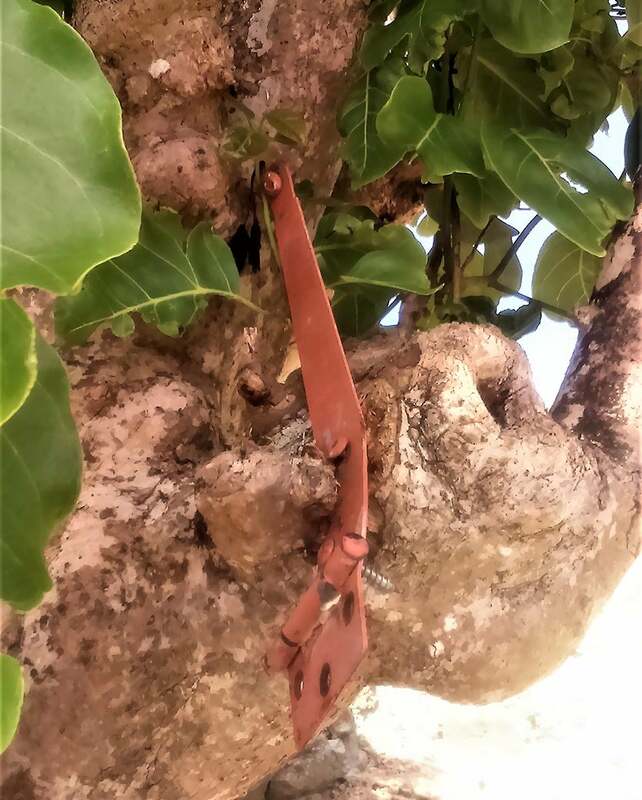 A door hinge embedded in a tree behind Serge Brin’s house on St. Barts, after passage of Hurricane Irma. Image credit: Serge Brin. Mr. Brin had this to say about the experience; “My weather station will be rebuilt before the next hurricane season, even stronger than before ! 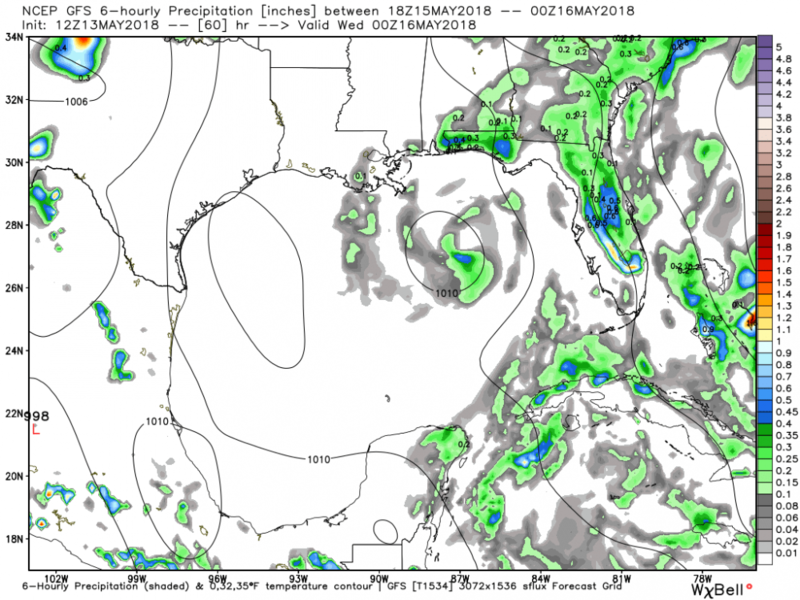 I have been interested in hurricanes since I was ten, with the passage of hurricanes David and Frederic in 1979, and in 1995, Luis had allowed me to see the power of destruction that could generate a powerful hurricane.” A huge thanks go to Serge for sharing his data and experience with us! The National Hurricane Center plans to mention the measurement in their final report on Irma, though the gust will not be classified as an official measurement. 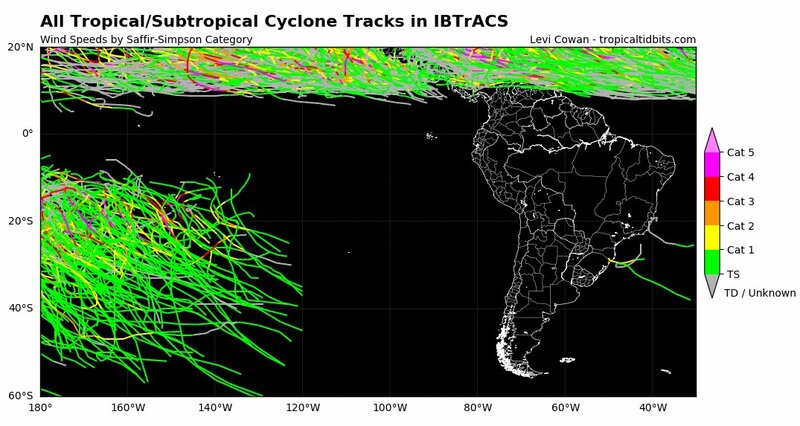 A Organização Mundial de Meteorologia retirou os nomes Harvey, Irma, Maria e Nate das próximas listas de furacões, devido aos grandes estragos causados por esses furacões em 2017. No lugar entrarão Harold, Idalia, Margot e Nigel. A lista de 2017, será usada novamente em 2023. 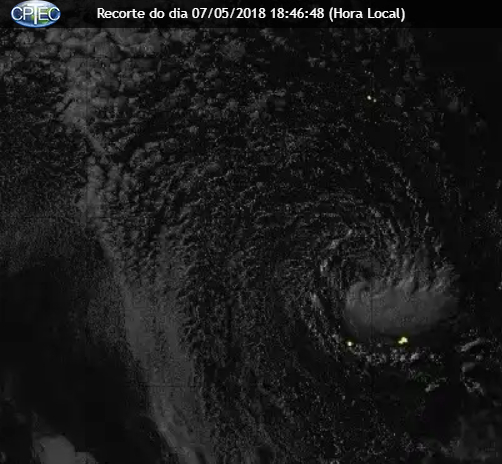 Olho nas Bahamas nesta semana. 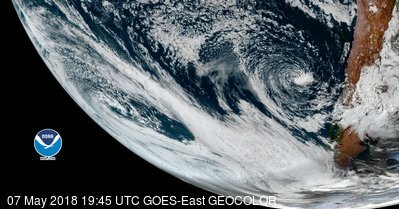 O sistema terá alguma condição de se tornar subtropical quando estiver mais próximo das Carolinas. Risco de desenvolvimento é baixo. Não sei se este é o tópico certo para isso, pois nunca vi uma baixa assim por lá. O que dizem os especialistas do BAZ ? Esse ciclone seria tão raro quanto o Catarina! 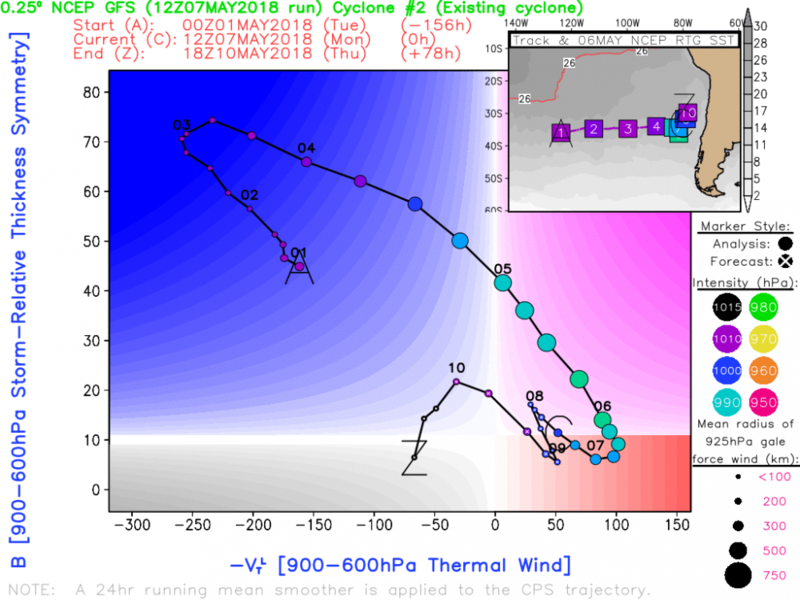 Essa região do Pacífico não tem um centro especializado em ciclones (NHC, JTWC, etc). Caso venha se confirmar será primeira vez na história! O mais próximo disto foi de 25 de Junho de 2017. Estava futricando e achei esse mapa destacando um possível ciclone subtropical. Enquanto isso no Pacífico Leste, começa a ser monitorado o primeiro distúrbio da temporada. Qual o fim dessa situação toda? Ou ainda estamos na situação? 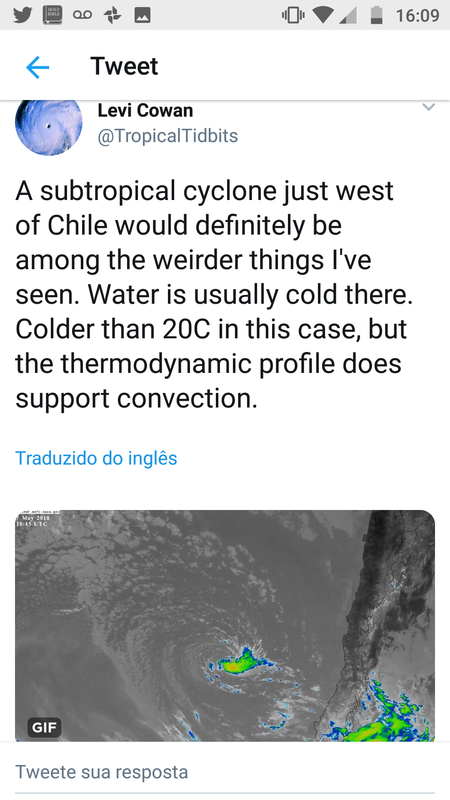 Fui pesquisar o que Tavares falou e houve um ciclone subtropical em 2015. Está mais de 24 horas mantendo convecção, na minha visão é subtropical. Como não existe um centro responsável nesta área, possivelmente somente nas reanálises do NHC devem confirmar. 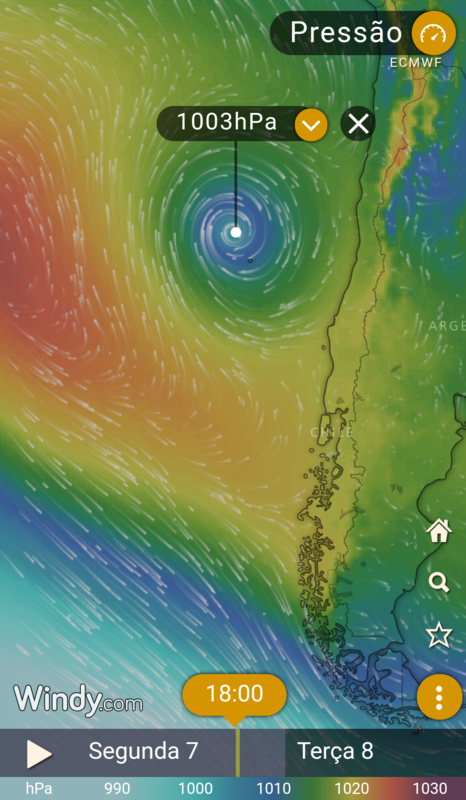 Tempestade tropical Aletta deve se formar amanhã. Caso se confirme a previsão vai quebrar o recorde, de primeira formação mais cedo registrado no Pacífico Leste. Recorde pertence a 2017, que viu o primeiro ciclone em 9 de Maio. 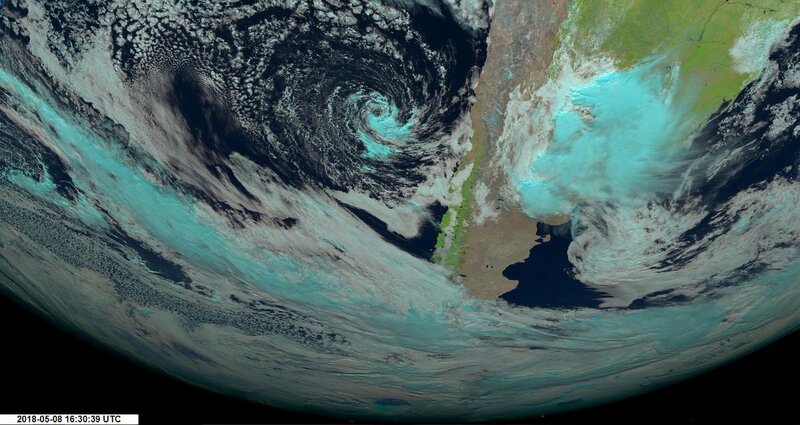 Ciclone no Chile foi classificado como subtropical segundo agências meteorológicas privadas (WU). Alguns meteorologistas pelo twitter e em fóruns americanos também concordam com a classificação de subtropical, alguns até mesmo sugerem que o sistema possa ter sido tropical por um breve momento. 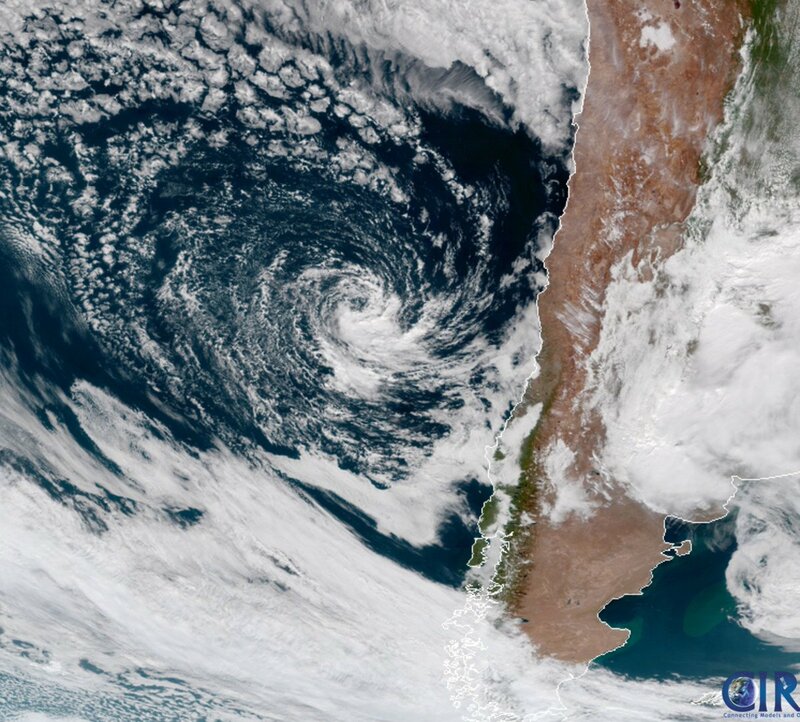 Dados da EUMETSAT mostram o sistema com um centro bem definido, com ventos ao redor de 65 km/h e pelos satélites notamos que a convecção se manteve por um bom tempo, perdendo força somente nas últimas horas. Uma estação perto da Ilha Robinson Crusoé registrou uma queda de pressão de cerca de 7 hpa durante a passagem do sistema. 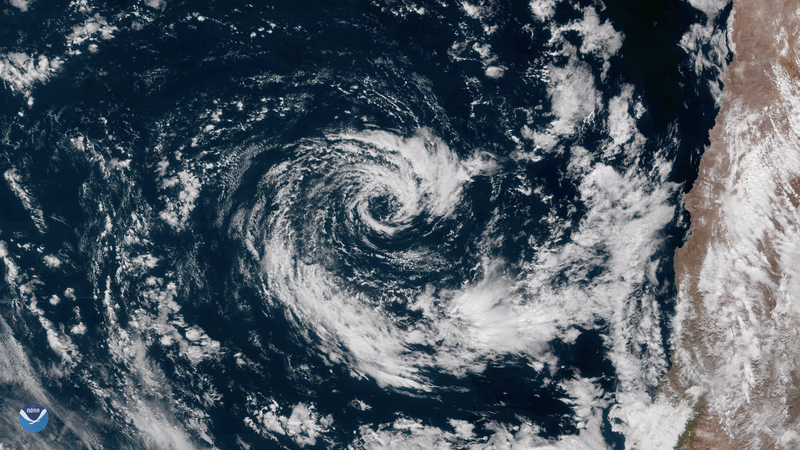 GOES East captured this image of an extremely rare subtropical cyclone in the southeastern Pacific Ocean on May 9, 2018. 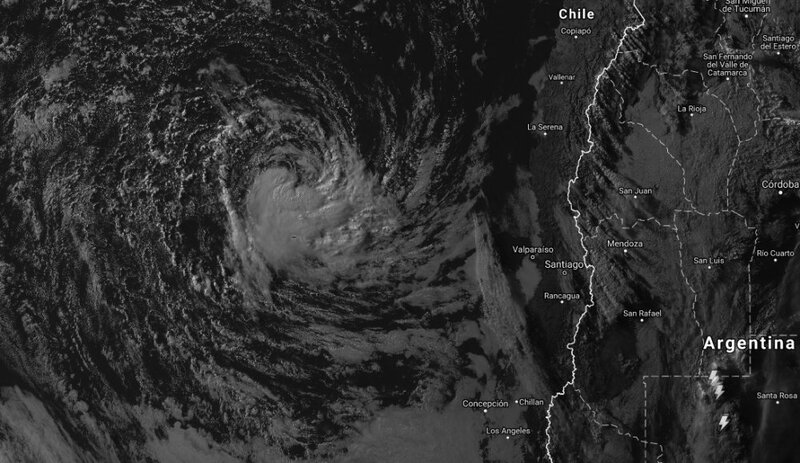 Located a few hundred miles off the coast of Chile, the hybrid storm shows characteristics of both tropical and extratropical low pressure systems, with a well-defined center of circulation that resembles an eyewall seen in true tropical cyclones. 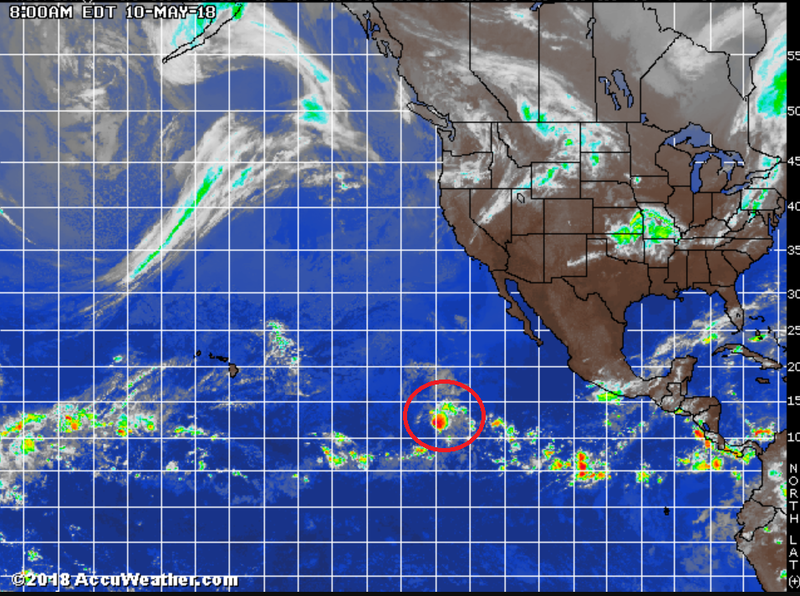 The southeastern Pacific Ocean is normally not conducive to tropical cyclone development. 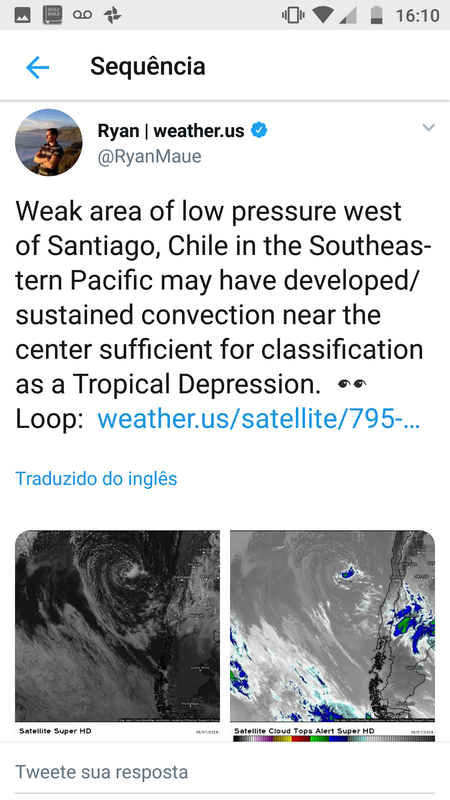 Sea surface temperatures off the west coast of South America are normally far too cold and the region is located in a semi-permanent high pressure zone, characterized by dry, sinking air. NOAA satellite data show sea surface temperatures at the site of the storm just under 20 degrees Celsius (68 degrees Fahrenheit). While these temperatures are not usually warm enough for convective activity, the right atmospheric conditions in the vicinity of this storm allowed thunderstorms to form, with wind speeds attaining the strength of a weak tropical storm. This geocolor enhanced imagery was created by NOAA's partners at the Cooperative Institute for Research in the Atmosphere. 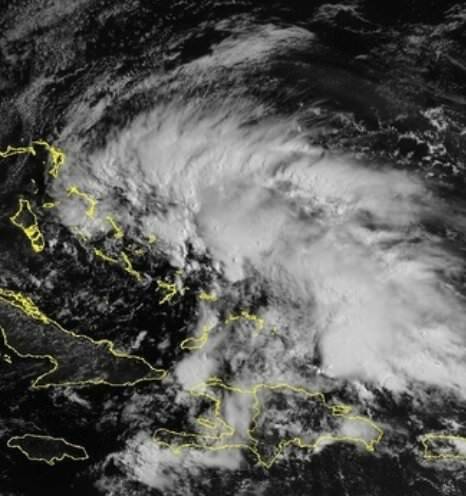 The GOES East satellite, also known as GOES-16, provides geostationary satellite coverage of the Western Hemisphere, including North and South America, the Atlantic Ocean and the eastern Pacific Ocean. First launched in late 2016, the satellite became fully operational in December 2017. FORMA-SE A PRIMEIRA DEPRESSÃO TROPICAL DO PACÍFICO LESTE EM 2018. Depressão 01 formou-se em alto mar, faltando 5 dias para o início oficial da temporada na bacia. 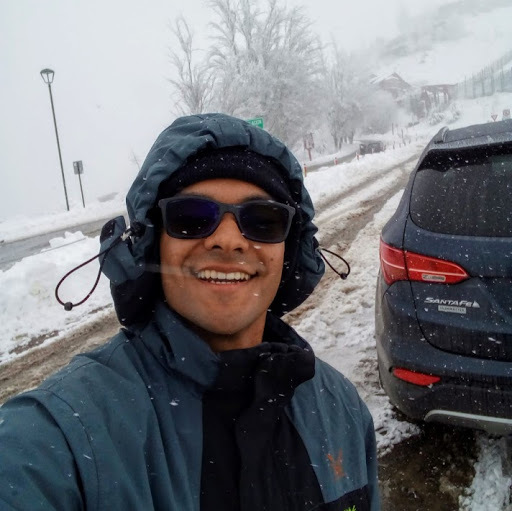 O sistema é influenciado por fortes correntes de vento em altitude, o que desfavorece seu desenvolvimento em uma tempestade tropical, com isso não deverá ser nomeada. 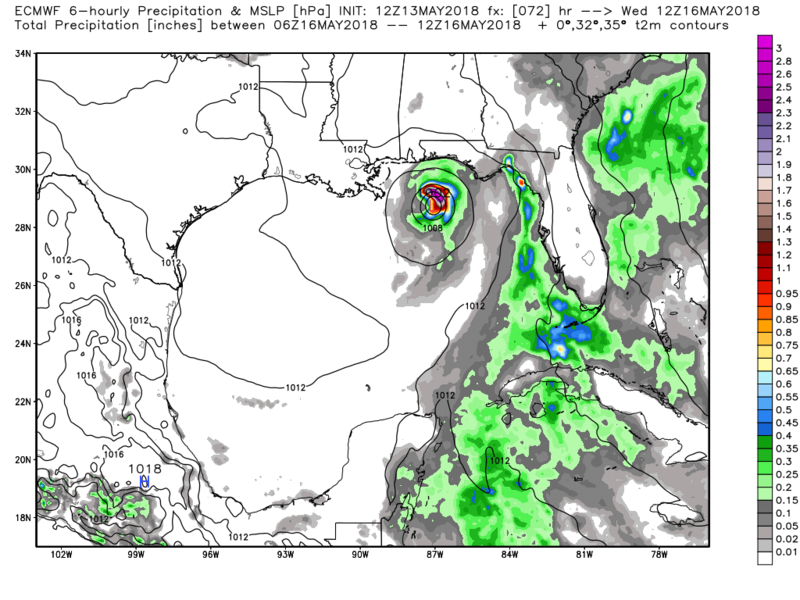 Saída desta tarde do ECMWF dá a entender para a formação de uma Tempestade Subtropical ou Tropical no Golfo do México nas próximas 48-72 horas. 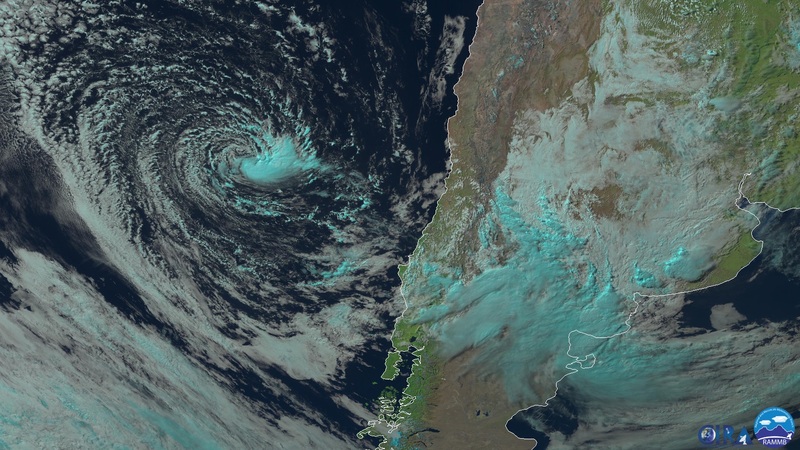 A baixa teria suporte de um Upper level low, e conta com SST em torno de 23-25ºC. GFS desta tarde, de uma forma mais distante, segue o EURO e mostra a baixa também. Caso se forme, será nomeada de "Alberto".